I loved this episode. There is so much happening here that you just have to watch closely. The episode is a Sayid-centric episode where Sayid is captured at the end of Desert Storm and the Americans, led by Kelvin Inman of all people (the Kelvin who winds up in the Swan station with Desmond) and Kate’s father. They want to find an American helicopter pilot captured by the Iraqis and they use Sayid as a translator. Eventually, Sayid becomes a torturer to gather the info he needed. Back on the Island, Rousseau arrived with news for Sayid. She took him to one of her traps where she had captured a man calling himself Henry Gale. I mean… he is breathing so he is lying. But, at this time, no one knew for sure. It was great to be uncertain because either way there is supreme emotional moments. Either you have captured on of them or you have been torturing an innocent man. Of course, Henry Gale is Dorothy Gale’s uncle in the Wizard of Oz and there is a hot air balloon involved as well (by the Wizard). The Wizard, a man who is pretending to be someone he is not, is how the Wizard arrived at and leaves Oz. See the connection. 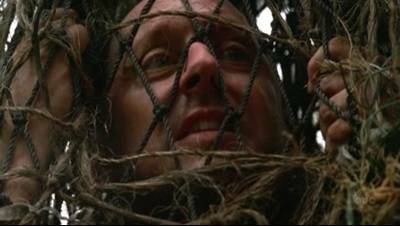 Michael Emerson played Henry Gale who would become Ben Linus. Emerson won several Emmys for the role and he was consistently brilliant as the conflicted and manipulative Ben. Emerson is magnificent here already as he is completely believable as a man who is frightened about being tortured despite not knowing anything. He sounds as if every question is answered perfectly. But Sayid still did not believe him. It could be that Sayid has been waiting for someone to take out his anger and frustration on over Shannon’s death. He even said it here. He said that Ana Lucia was responsible but it was an accident because she had been made to fear the Others so much through the 48 days of hell they went through. When I first saw this, I believed that Henry was lying because I trusted in Sayid, but there was always that doubt in the air. We also got the first glimpse of the hieroglyphics that happen when the timer reaches zero in the Hatch. Jack was forcing John to open the armory where Sayid was torturing Ben and Jack threatened to let the timer go to zero. John opened the door and rushed off to put in the numbers as quickly as he could. You would think that John wouldn’t constantly mistype the numbers, but he put 15 in twice and had to go back over it. The hieroglyphics were extremely scary as they started to turn and the buzzer got worse. Imagine what would have happened if Locke hadn’t entered the number with Ben in the armory with Jack and Sayid. The secondary story was a funny one involving Sawyer and Hurley and a tree frog. Everyone has rejected Sawyer, so he had to blackmail Hurley into helping him catch the tree frog that was keeping Sawyer from sleeping. When Sawyer crushed the tree frog in his hand, it cemented Sawyer as the jerk. By the way, Charlie showed up with his hood down, so I guess he was not Dark Charlie at the moment. This was an epic episode with an amazing debut of a vital character.